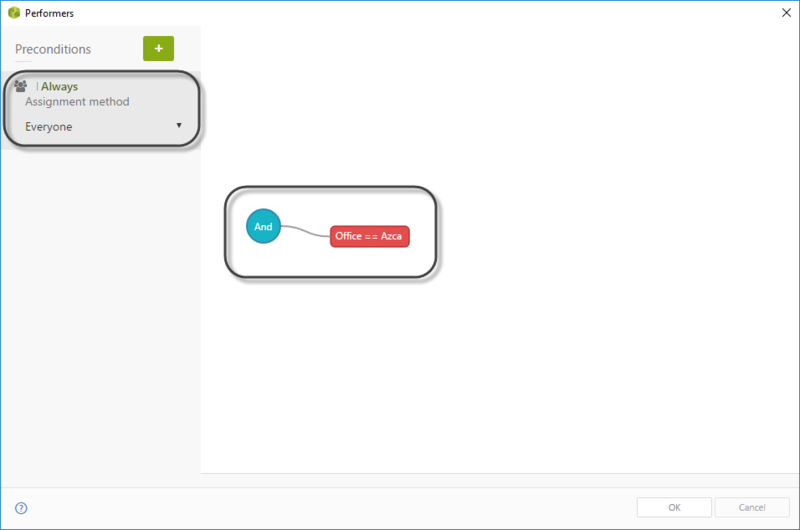 In Bizagi Studio, a developer of a process configures the performers of each task in order to assign the activity to a specific set of users according to the rules defined. There is a special case of this assignation, the Everyone method. Such option marks everyone (who matches the preconditions) as a possible performer for the task. When this assignation method is chosen, whenever the task is reached in the execution flow of the process, the inbox of each user that matches the preconditions configured on the task will show the activity as available. Initially the task will not have a performer assigned, thus the assigned user will be labeled as Unassigned. In the next section of the article you can find information related to the assigned performer once someone opens the task or marks himself as assigned, that is, after taking ownership of the task. As previously mentioned, when the Everyone assignation method is selected for a task, all users will have the activity available on their inbox but no one will be actually assigned as responsible. Then, who is it assigned to? By default Bizagi is configured to assign the task to the first user who opens it (or click the Work on it option). There is an additional option to this behavior known as the Read Only View. 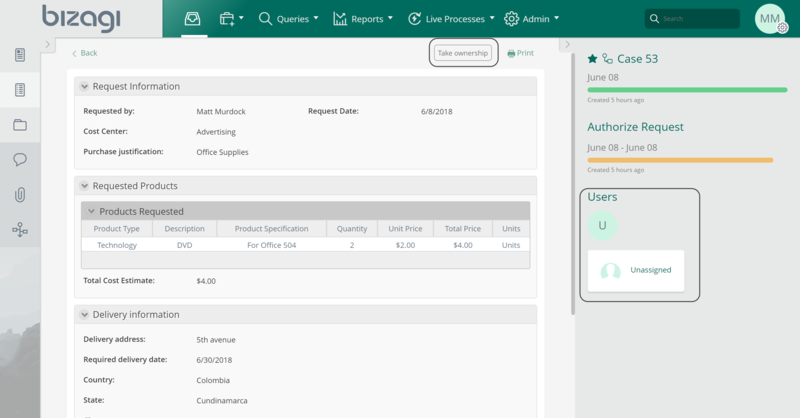 When enabled, if a user clicks the Work on it option or enters the activity, he/she can review the forms and the actions that need to be performed, but the task will not be assigned to him/her. In order for a person to effectively be assigned to the task, he/she will have to access the Read Only View and then click on the button displayed on the upper right corner of the task, labeled as "Take ownership". Once the task is assigned to a user, the behavior of the activity is as expected: it will no longer be available in the inbox of the other users, thus, they will not have the option to work on it. When a case comes in its workflow execution to that task, it will be marked as unassigned and available for all matching users, who will have to Take ownership of it to be able to perform the activity. This will also be evidenced when opening the activity details on its right panel. 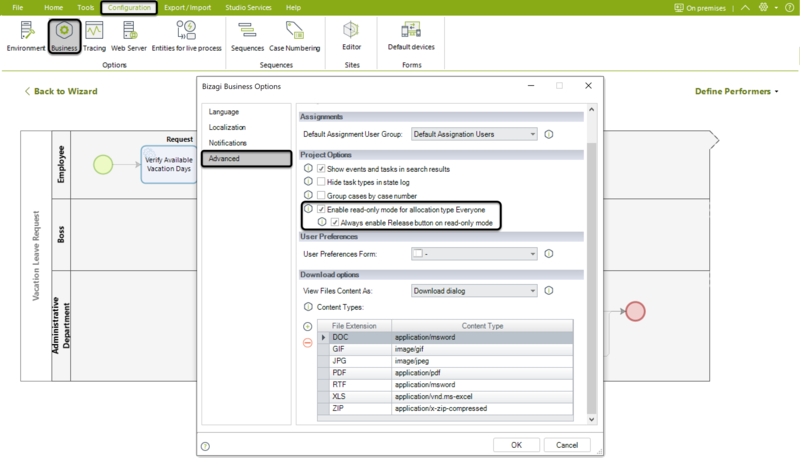 In order to enable the Read Only View, you need to explicitly enable the option, which is available in the configuration tab, under the advanced options of the business configurations. Notice that initially and by default the option is not ticked. A person that has a task assigned, may not be able to perform it or for any other reason, might want someone else to be accountable for it. Thus, Bizagi provides the Release functionality. When a person is already assigned to a task, when he/she enters to work on it, on the upper right corner of the activity a Release button will be available. When such button is clicked, the task will go back to everyone's Inbox, by running assignation rules again. This means that if the assignation method of the task is Everyone, it will be unassigned and available for all users that match its preconditions, including the user that just released the task. •Read only mode is enabled at runtime for end users when the task has been allocated to more than one user, AND the Everyone allocation method is present in at least one of the preconditions to assign the task's performers. •When a case has not been assigned, namely no one has taken its ownership (or no one has opened the task if the read only view is disabled), reassigning the task will only add the selected user to the list of users who can take the task's ownership, this action will not assign the task to the selected user. •The Take ownership/Release capabilities are not available for delegated users. This means that if a user who has a task available due to a delegation and he opens it, that user will be automatically assigned to the task. •When searching cases, you can use the unassigned text to find all those cases which are not already assigned to a user. 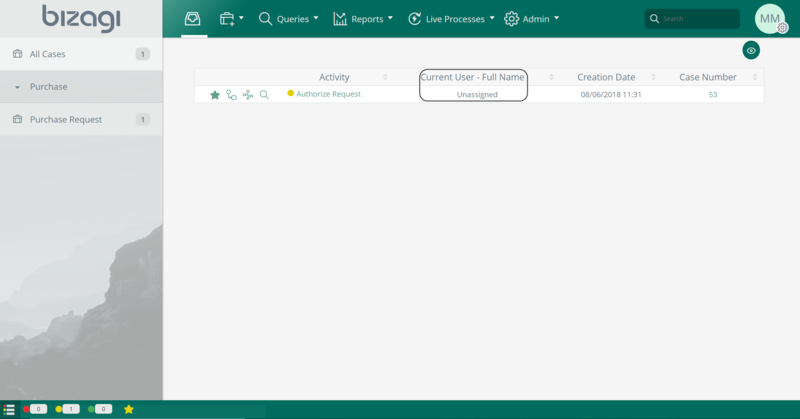 •In Queries you will also find the unassigned tasks, this also applies when exporting those query results to Excel. •In the Cases Management option in the Work Portal, the unassigned status will also be reflected. •When sorting, the unassigned status will not be considered. 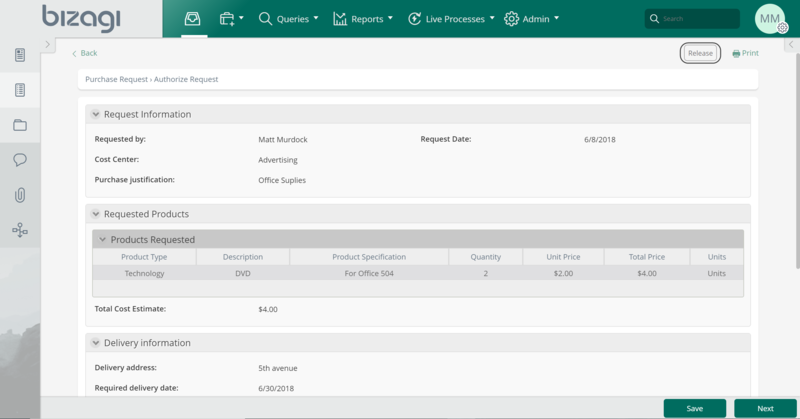 •In the detailed case list of the BAM and when exporting it to Excel, unassigned tasks will not be considered. •When the Read Only View is enabled, the Work on it option will not assigned the user who clicked it to the task. •Plans on the task, will only be available when it is assigned to a user. •Only when a task is created or released the allocation rules are executed. As such, when your users' properties change, the pool of possible users for the unassigned tasks will not change, even if new users meet the criteria or the previous user can no longer fulfill it.